Almost 4 000 tickets sold in a month since opening night! Teatr Śląski first in Poland staged Angerman’s and Kidawa-Błoński’s film story. An adaptator and director is Arkadiusz Jakubik. After auditions main character part went to Tomasz Kowalski, winner of the 4th edtion of "Must Be the Music" tv progamme (T.K. after bike accident was substituted since September by Maciej Lipina, frontman of Ścigani band). Dozen or so Teatr Śląski actors, band on stage, Silesian naive painters atmosphere and immortal songs of Dżem make touching story about friendship, freedom and love but above all about not always victorious fight with oneself. Maciej Lipina (from 2014 impersonator of Rysiek Riedel in the performance) – vocalist, guitar player, composer, lyricist and music educator. Founder and leader of "Ścigani" band. Leading voice on acoustic album of KAT Acoustic 8 Films, legend of Polish rock and metal. One of six soloists (beside Hanna Banaszak, Beata Rybotycka, Elżbieta Towarnicka, Zbigniew Wodecki and Jacek Wójcicki) in oratorio by Jan Kanty-Pawluśkiewicz and Leszek Aleksander Moczulski – Ludzimierz Vespers. Beno Otręba, Dżem’s bassist, in commentary for Katowice edition of "Gazeta Wyborcza"
Performance directed by A. Jakubik, outstanding actor from W. Smażowski’s films, has one great trump-card: Tomasz Kowalski as lead actor, who has phenomenal voice and brilliant sense of blues. Arkadiusz Jakubik created Silesian-hippie form of performance, inspired by Szopienice naive painters. He gave troupe freedom aiming not at perfection of details but at force of emotions and collective creation. Non-pro actors turn up there, midget in circus artist costume, mute Silesian insurgents, militiamen, old women and saints and Blue Buddha. The effect is incredible. 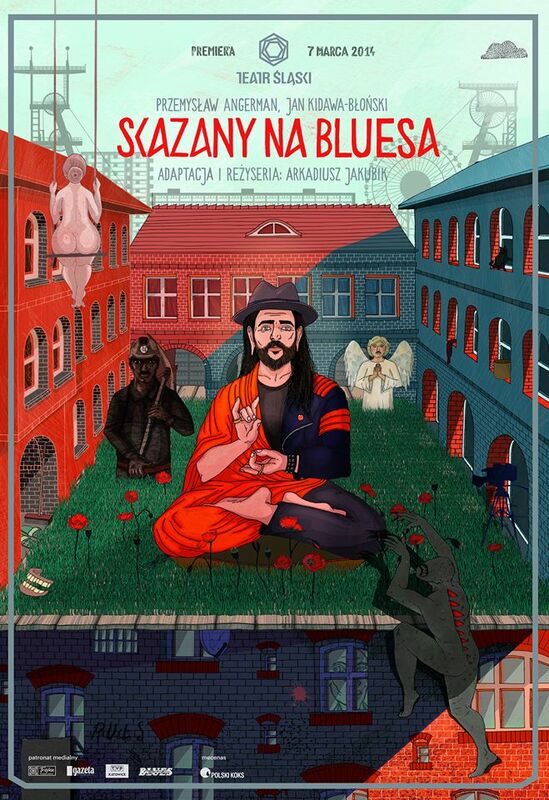 Silesia has blues in its blood. All Silesian feel blues. This music is everlasting, goes to heart of everyone, who listens to it. Erwin Sówka, painter from Nikiszowiec in commentary for Katowice edition of "Gazeta Wyborcza"
"Condemned to Blues" in Teatr Śląski in Katowice is like a drug. It addicts and absorbs with every passing minute. (…) Premiere evening ended with dozen minutes standing ovation, double encors and loud Riedel’s name chanting. We have Przystanek Woodstock Festival in micro-scale plus arena (and lately concert) arrangement customed to theatre space. And it’s positively one of the most intriguing because unpredictable parts of performance to large extent created from emotions existing between audience and actors. Band accompaning Kowalski on stage (also with Maciek Lipina replacing J. Styczński) played loud, live and perfectly. With every song it remainded how great were songs introduced by Dżemy to the history of Polish pop music. The greatest scene of performance is "Letter to M." performed by Riedel-Kowalski, who emacieted by drugs reaches the end of his tether and stands mike in hand to fight for agreement with record lebel (…). Actors manage to make audience red-hot, so we can say even now that beside "Jesus Christ Superstar" in Teatr Rozrywki in Chorzów we have in Silesia region another music-theatre hit. Main part is casting bull’s eye. Tomasz "Kowal" (Blacksmith) Kowalski isn’t an actor, on everyday basis he plays with his band FBB in Trzebnica. He was also laureate of TV Polsat talent show "Must Be The Music". . "Kowal" on stage has unassuming charm of non-pro actor, and he sings devilishly well at that. [Tomasz Kowalski] unholily steals well deserved critics’ compliments for other actors and he (…) gave Riedel second life. Finely programed and bravado done audience music final with Kowalski’s encores, who put in concert mood even the coldest part of an audience, put aside all my personal question marks and hung the great one above a sence of wondering what this whole earlier tale was about; how much biographical truth was there, how much fabrication, how much manipulation, literature-theatre quotations and paraphrases, director’s tribute for the idol or holy and cursed silesianship. It’s a performance about great solitutde, destinated for every Other living outside cofines of thinking of his own clan. > Silesia Voivodeship Marshal award for young artist, category Theatre and Music, awarded Tomasz Kowalski.